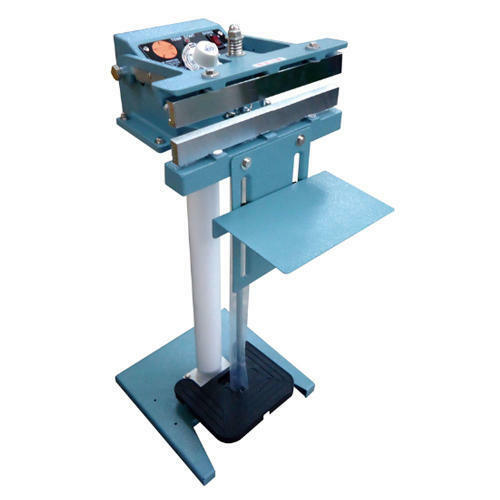 Materials packing width Max 12"
With our immense domain expertise, we are involved in offering Foot Sealer. The offered sealer is manufactured using superior quality components and innovative technology in compliance with industry norms. Furthermore, we offer this sealer in variegated sizes and designs as per the demands of the customers. Our quality examiners test this sealer against different quality parameters. Singh Packaging Industry is a one stop destination of Automatic Packing Machines that is established in the year 1993. We are the master of domain engaged in offering a quality assorted range of Automatic Form Fill Seal Machine, Pouch Packaging Machine, and Horizontal Pillow Pack Machine. Each of our products is a masterpiece that is made by using latest technological methods. The machines made by us are the perfect combination of engineering & technology. With our immense domain experience, we are able to continually expand our horizon in the entire nation. We follow efficient designing and development methods to procure a high quality range of fully automatic packing machines. Relentlessly working in order to provide high-quality engineering products at most competitive price ranges. In the industrial sphere, there is a heavy demand for quality sorted range of packing machines. To fulfill this demand, our experience technocrats have always been indulged in making excellent quality products with reliable features. Additionally, these machines come in compact sizes hence can be easily placed anywhere and occupy very less space. With the help of latest machinery, we can easily procure a durable & reliable range of products in order to satisfy our customers.